i Click 'view all' to instantly compare this good deal with offers on other top gift wrapping paper. 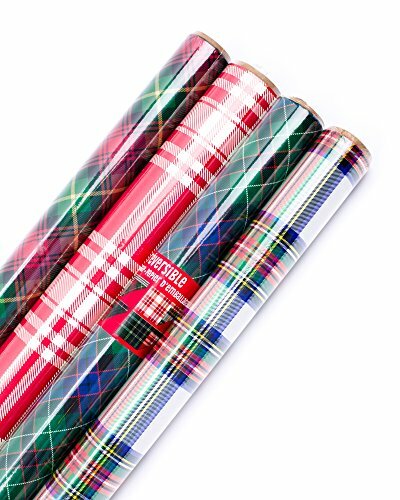 Kraft Classic Wrapping Paper Set 6 Rolls Multiple Patterns 30"x120"
Hallmark Reversible Christmas Wrapping Paper Bundle Plaid Pack of 4 is currently selling at $9.99, approximately $0.26 lower than average, giving a potential saving of $35.00 right now. With a lowest price of $9.99 and an average of $10.25 it is selling on the low end of its usual range. Price volatility is 0.74% (meaning it does not change often), so the price should stay low for a while. Right now this product is a recommended 'good deal'. The current deal is also the best price on this item over the last month. Compare the current price, savings (in dollars & percent) and Buy Ratings for the top Gift Wrapping Paper that are closely related to Hallmark Reversible Christmas Wrapping Paper Bundle Plaid Pack of 4. Here is how Hallmark Reversible Christmas Wrapping Paper Bundle Plaid Pack of 4 compares with other leading Gift Wrapping Paper. Share the spirit of the holiday season with friends and family. This pack of holiday wrapping paper contains six cheerful designs in three reversible gift wrap rolls. Modern foil designs in red, green, and blue look perfect together, and plenty of square footage on each roll makes it easier than ever to wrap presents of all shapes and sizes. The Hallmark brand is widely recognized as the very best for greeting cards, gift wrap, and more. For more than 100 years, Hallmark has been helping its customers make everyday moments more beautiful and celebrations more joyful. 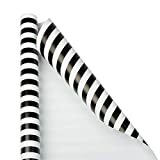 FeaturesEach roll in this holiday wrapping paper set measures 30" wide x 12.5 feet long for a total of 31.25 square feet per roll. 125 total square feet.Six designs in total, each one in a unique plaid print in shades of green, blue, black, and red.Festive designs easily elevate any gift and make it easy to share the spirit of the holiday season with the ones you love.A great value! Four rolls, eight different designs. Each coordinates perfectly with one another for a beautiful spread under the tree on Christmas morning.